The "Concordia Theatre", was officially born as a city project ori the 28th july 1827, during a meeting of associates of the local "Music Society". support which fund raising took place as weII as putting shares at each adherent's disposal. The building of a theatre upset Father Pizzi (he was the parish priest of the Church of Our Lady of the Sea), as he would have preferred people to think about building a new church rather than a theatre. 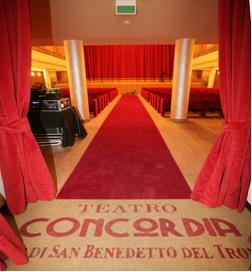 The theatre was built with three rows of boxes and was named "Concordia" to remember the agreement among the wealthiest families of the city and to consolidate g ood relations with Grottammare after bitter debates over territorial boundaries. According to a deliberation by the City Advisory Council on 22nd June 1830 the future theatre was given to the Municipality, but the joint-owners reserved to themselves the right to use boxes, except for some which passed to the Municipality without any obligation . Ludovico Graziani and his brother Francesco, baritone, from Fermo made their début there . In 1843 the prima donna Enrica Morelli also performed there and at the end h er Lucia Lammermoor, she was accompanied to her lodgings by a rejoicing crowd with torches and much cheering. Indeed Concordia theatre was also used as court room, conference hall, place where parties and charity lotteries were organized, polling station and meeting place for assemblies of the Mutual Benefit Society. Crispi Street ), the Virginia Theatre with annexed Hotel Eden was opened by Teodorico Pomponi in July 1920 (in 1953 it was transformed into a church and entrusted to the Holy Sacrament Fathers). The Concordia Theatre was badly damaged during the bombardments of the Second World War, its equipment and furnishings were almost completely destroyed or stolen, because it had also been used as an encampment by Allied troops. Once the war was over, the Municipality made Teodorico Pomponi manager, as he jointly owned the majority of boxes and, in the meantime, had ceded his Virginia Theatre to the Holy Sacrament Fathers, present in the city since 1939. lt was opened at Christmas 1947 restored and totally altered into a cinema. The old Concordia Theatre, later Pomponi Cinema, was acquired again by the Municipality at the beginning of the nineties and assigned to a private company almost exclusively for cultural, and above all theatrical, purposes. Found unfit for use, it was definitely closed. The municipal Theatre has been reopened after restoration on April 30th, 2008 and it is now used as a place of culture by the citizens: it was named "Teatro della Concordia" (Concordia Theatre) just like in the past. The building is quite large (extended to the North and South) in comparison to the original project, with neoclassic elements on the main fronts: frames, corbels and string-courses in brick at the various levels, and pilaster strips also in brick at the corners. The ground floor has three portals with stone piers and capitals and a composite trabeation in brick. The upper floors are marked by openings with brick fiames or copings and a cornice in notched brick at the top.